Las Vegas Valley Water Department is a not for profit utility. It began providing water in 1954 to a service area of around 45,000 residents. Today, it services more than 1 million people which includes Las Vegas and many of the surrounding communities. The Las Vegas Valley Water District (LVVWD) is one of the most respected water districts in the United States and has been for decades. This municipality has seen success and recognition for this success throughout their 60 years of existence. If you look at their "History" page on LVVWD's website, you'll see evidence of this with multiple awards won over the years. What's interesting about their elevated status is that they do some things differently than the majority of other water utilities. Since the 1990’s, Nevada state code has required builders to install the backflow prevention assemblies in new commercial properties. LVVWD has multiple policies in place to ensure all commercial properties follow the state code. The Water District's backflow prevention program requires the installation of backflow prevention assemblies on commercial buildings, multifamily properties and irrigation systems. The water district determines whether an assembly is required at a specific property. Backflow assemblies are installed according to water district installation requirements, and the district will inspect installations after they are completed. To fulfill state requirements, the LVVWD prioritized backflow installations and has begun systematically retrofitting properties that require protection (commercial buildings, multifamily residential properties and irrigation service). In most areas property owners have full responsibility for their backflow prevention devices. 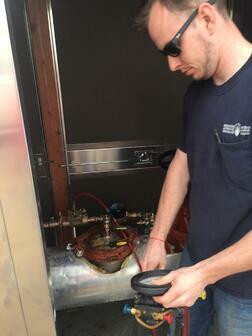 The building owner must hire their own backflow testers, and keep their backflow preventers maintained themselves. In Las Vegas, the water district actually owns all the backflow devices. This means they perform all the maintenance and ensure the devices are tested as needed. Customers who currently have backflow assemblies and those required by law to install them are assessed a monthly service fee based on the size of the meter to cover the cost of the Water District to maintain, test, and replace backflow prevention devices. Here's the full rundown of the LVVWD's policy. The Nevada state code requires the use of a backflow prevention device on commercial properties. It also requires annual testing. The backflow prevention rules are in the Nevada state code section 445a.67185. Rules such as these aren't uncommon. We all know backflow assemblies are required on commercial properties, and that annual testing is also a common requirement. LVVWD has taken these requirements very seriously, and have taken measures to ensure they meet the requirements. In some areas, the water authority has difficulty seeing their requirements met by property owners. Corpus Christi comes to mind. To remove the hurdle of getting customers to handle their own compliance, LVVWD has taken on that burden themselves. This also helps them maintain an accurate record of installation and testing. They can also be sure that all the devices are being maintained so that they last longer and are more reliable in the long-term. Sometimes customers push back on policies that require them to pay for maintenance, testing, or even repairs or replacements. LVVWD doesn't have this problem, as they charge a monthly fee, so there aren't any sudden large investments required on the customer's part. A representative from the water authority also says it's brought "deeper engagement with the public about the importance of backflow prevention." It's a tough subject to get people outside the industry interested in, so that's a great achievement in of itself. This comes from their "About" page on their website. The staff and leadership seem to have embraced this concept over the 60 years of the district's existence. It continues today with the way the cross connection control program is run. Owning, testing, and repairing the district's commercial backflow devices may sound completely novel to other water authorities. To those in Las Vegas, it's been the norm for decades now, and it's worked quite well for maintaining water quality. There are still plenty of changes to undertake. Recently, LVVWD began working on a large project to retrofit backflow devices that are installed in below grade vaults. They plan to move all of these devices above grade over the next 10 years. Programs like this one are possible, but not typical, everywhere across the country. The Las Vegas Valley Water Department will likely continue to lead the way in finding more efficient ways to improve backflow prevention.